Think 200-square-feet is too small? This tiny cabin, featured on FYI Network's Facebook page, proves that you can still have luxury at small scale. That's right -- downsizing to a simpler life doesn't mean you need to give up modern amenities. For starters, this home comes equipped with the latest technology -- built in TV, recessed lighting, and more. The living room features a large fireplace and built-in shelving. The arch in the ceilings adds additional height and creates the feeling of increased space. The hardwood floor ceiling is a true standout in this spacious kitchen -- not to mention the large kitchen island. Yes, there's a full stove, sink, and fridge. Each bedroom has plenty of windows to let in natural light. The total square footage of this home is around 400 square-feet. The extra space makes it easy for a larger family to move in. If two bedrooms aren't enough, there's also additional space in the loft. The best part? Check out this luxurious bath. According to Tiny House Nation, this bathroom comes with an incinerating toilet -- the only one in the United States --- and a "rain-style shower." 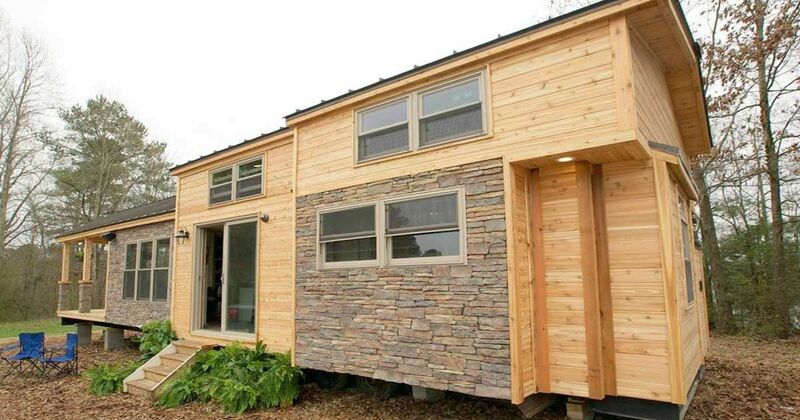 Enjoyed this tiny home? Be sure to SHARE it with family and friends!